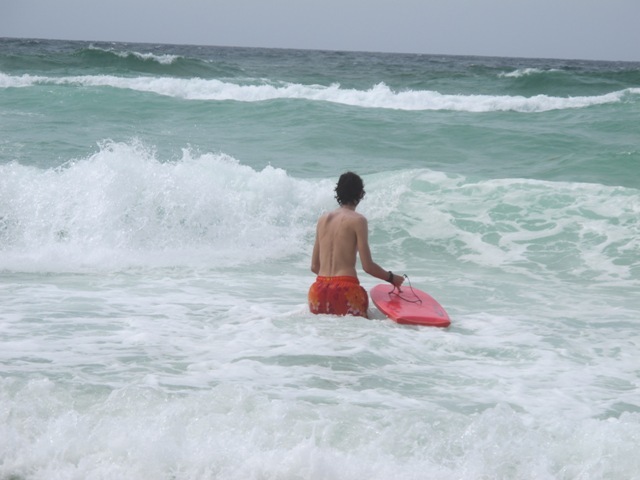 We spent last week in Destin, Florida. I intended to post here while we were gone, but it just didn’t happen. I’m almost caught up on laundry for the trip, so here’s a recap before it’s totally irrelevant (and before I forget everything!). A bit of background — my MIL has a timeshare at a beachfront resort in Destin, FL. Her unit is a studio, and, while I’d made the trip with Matthew and his mom a time or two before G was born, three adults and a baby/toddler crammed into one small studio was not my idea of fun (also, I’m not really a beach person). For the past two years, I sat out this trip and enjoyed some much-needed solo time. However, after two years of seeing pictures of G enjoying the beach, I gave in to Matthew’s urging and joined them this year (to preserve everyone’s sanity, we rented a second studio unit). Prior to the trip, I did find myself wishing that I’d gone last year instead, when G was a bit more easy-going, but that’s hindsight for ya! I was also a bit worried about making the trip at all, given G’s ongoing cough, but by our departure day, things seemed headed in the right direction, if not completely resolved. 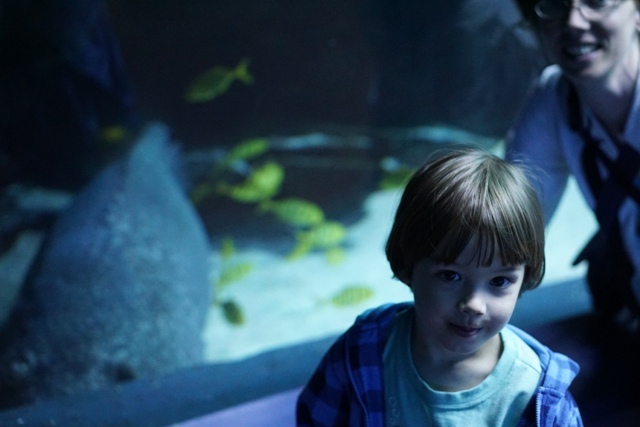 We drove from St. Louis to Atlanta, GA — not the most direct route to Destin, but my MIL wanted to take G to the Georgia Aquarium to see the whale sharks. We got on the road about an hour later than planned because someone couldn’t drag himself away from the garden. This put us on target to hit Nashville around 4pm, which I hoped was early enough to beat rush hour traffic. Of course, it was not. We lost a lot of time in Nashville and didn’t arrive in Atlanta until 10pm (though that was losing an hour to the time change, so not crazy late for Central time). G fell asleep in the car, but woke when we exited the interstate in downtown Atlanta. He was disoriented and crying, as well as coughing a lot (to the point I thought he might vomit as we were trying to unload and figure out parking at the hotel) — so, basically a hot mess. We managed to get him settled in the room, before turning in ourselves. Even with the time change, we woke bright and early on the day of our aquarium visit. In my head, the aquarium was going to be similar to a zoo: outside displays, lots of ground to cover, and sunny and hot, but with fish instead of animals. Maybe I was thinking about Sea World? Anyway, in reality, the Georgia Aquarium is a large indoor structure (could have left the sunscreen in the car), and we easily saw most of it in under two hours (we skipped the dolphin show because G didn’t feel like waiting in line). 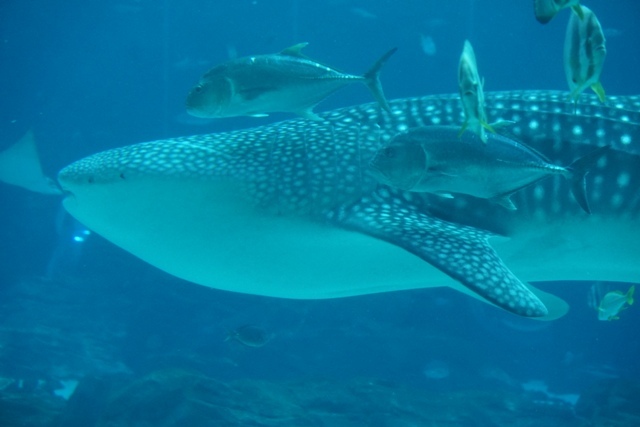 The whale sharks were pretty cool, as were the large sting rays that shared that tank. The aquarium has a new beluga whale calf, but they’re giving mama and baby some bonding time (maternity leave? ), so the tank was completely curtained off. Totally understandable, though I was a bit bummed to miss the chance to see baby beluga (when I started singing the Raffi song at the aquarium, I swear that G gave me a “Mom, please, you’re embarrassing me” look). We also overlooked/missed a hands-on kids area that would have been nice for G. All-in-all, it was a nice visit, but at almost $40 per person, not something I’d repeat anytime soon. 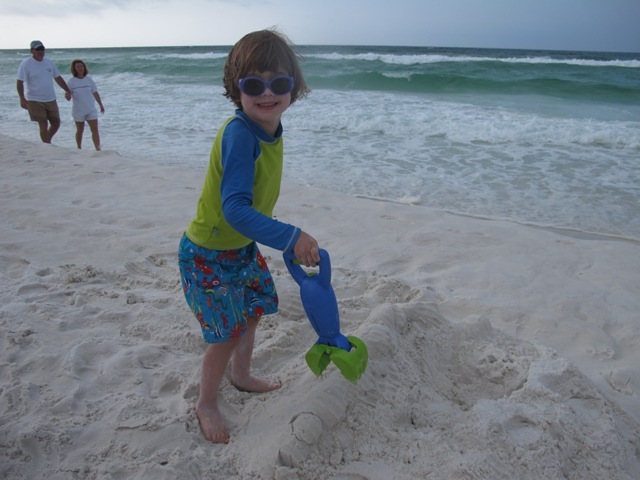 We grabbed lunch on the way out of Atlanta and made tracks for Destin, though not nearly fast enough for G. When we were about two hours away from our destination, he announced, “I had planned to be at the beach right now. When are we going to be there?” It was a long two hours. Beach time! We had pretty great weather overall. 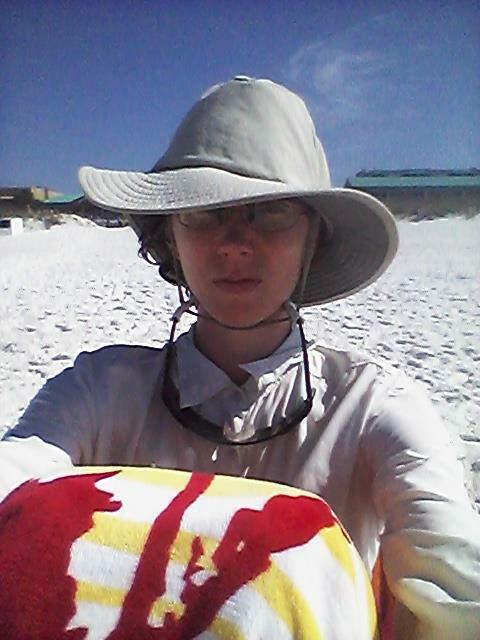 Temps never climbed higher than 85°F — with cloud cover and beach breezes, that was pretty ideal for my vampire ways. 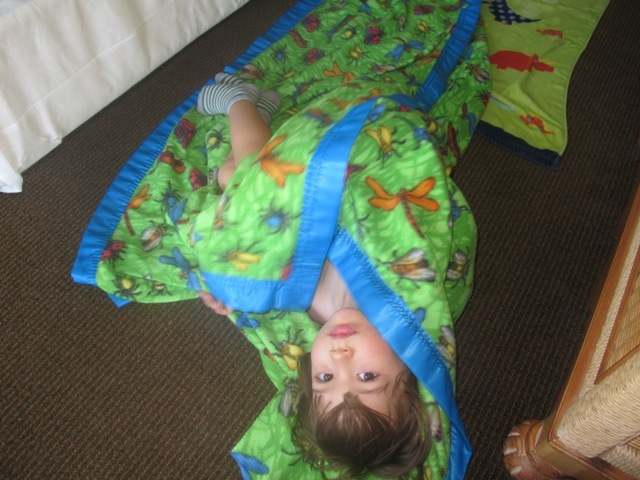 G’s favorite indoor activity was rolling around on the floor (ick!) saying, “I’m a kitten. I’m sick, and I need a paramedic.” At which point any adults present were expected to grab some medical tools (i.e., co-opted cooking ware) and help the kitten. More fun the first time than the fiftieth . . . . The units have full(ish) kitchens, and we mostly ate in — I’m working on a vacation food post for later this week. Also, G’s cough completely resolved while we were gone! On Saturday, we all piled back into my MIL’s Camry for the long drive home. It’s worth noting here that the only way that three adults, one child, and gear for a week at the beach fit comfortably in a Camry was with the addition of a roof-top bag, which, childhood memories notwithstanding, worked great! We left Destin at 7:30am on Saturday. Less than three hours into our 13 hour (plus stops) drive, G announced that he was ready to get out of the car. His statement did not bode well for the rest of the day, but things actually went rather well. G eventually took a nap, which gave all of us a nice break, and then fell asleep for the final two hours. Matthew’s mom dropped us off at home just before 10:30pm that night, and once in his own bed, my sweet sleepy boy curled up and went right back to sleep while we finished unloading the car. I spent Sunday morning in a complete daze. It felt like I had jet lag, despite the lack of a jet, or even changing time zones. My back was also none too happy about all of that car time! All in all, it was a nice vacation. Having my MIL with us meant that Matthew and I got some breaks. I don’t think I’ll join them every year, but it was nice to experience with G (though I wish we’d been able to get him into the ocean a bit more). This entry was posted in My Life and tagged travel, vacation. Bookmark the permalink.